Triglycerides: Mendelian Randomization Studies Suggest Causal Role, but How to Treat in 2019? Hypertriglyceridemia (HTG), defined by fasting levels at or exceeding 200 mg/dL, is characterized as a pro-inflammatory, pro-thrombotic, metabolic state associated with endothelial dysfunction, insulin resistance, type 2 diabetes mellitus (T2DM), and increased risk of cardiovascular disease (CVD). Mendelian randomization studies now support a causal role for TG-rich lipoproteins in CVD risk enhancement. Yet, until recently, only post-hoc analyses from clinical trials suggested that treating HTG would translate into reduced CVD risk. The results of Reduction of Cardiovascular Events with Icosapent Ethyl–Intervention Trial demonstrated for the first time that patients with HTG and elevated CVD risk (i.e., pre-existing CVD or DM with additional risk factors) benefited after treatment with icosapent ethyl (IPE), a highly purified eicosapentanoic acid (EPA) taken 4 g daily. Ironically, the TG-lowering effect of IPE was relatively modest (20%), suggesting the interplay of other mechanisms beyond TG lowering that contributed to the robust benefits observed (25% relative risk reduction in the primary CVD endpoint). These mechanisms include downregulation of pro-inflammatory signaling pathways and restoration of endothelial dysfunction, cellular processes that are aggravated in HTG states. Consequently, high-risk patients with HTG should be considered for IPE therapy beyond traditional measures outlined in the 2018 American Heart Association/American College of Cardiology/Multi-Society Cholesterol Guidelines, pending the results of two ongoing clinical outcome trials, Statin Residual Risk Reduction with omega-3 carboxylic acids (Epanova®) in High Cardiovascular Risk Patients With Hypertriglyceridemia and Pemafibrate to Reduce Cardiovascular Outcomes by Reducing Triglycerides in Patients With Diabetes. 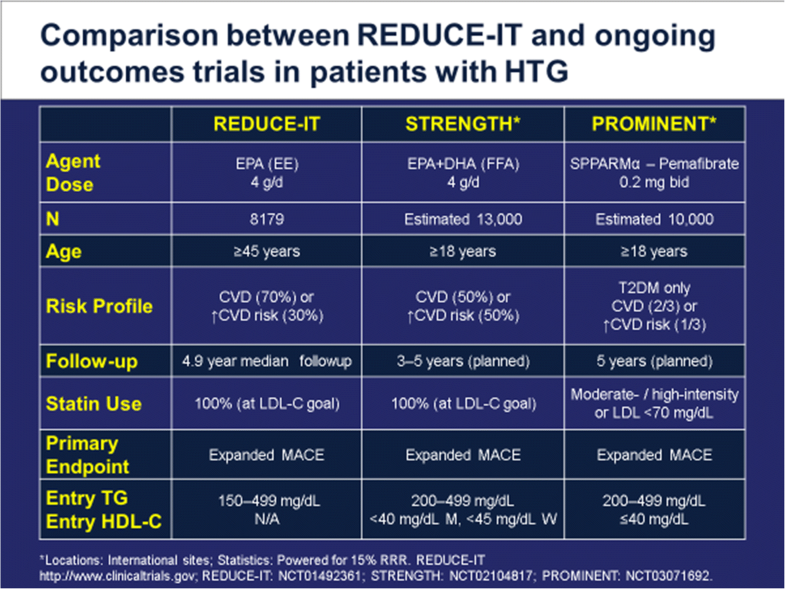 Taken together, HTG reflects a highly atherogenic and pro-inflammatory state for which evidence-based therapy has now been demonstrated. Dr. Miller is a consultant for Amarin and serves on the Steering Committee for the REDUCE-IT Study. Dr. Park has no conflicts of interest. This article does not contain any studies with human or animal subjects for which either co-author served as site investigator. Grundy SM, Stone NJ, Bailey AL, Beam C, Birtcher KK, Blumenthal RS, et al. 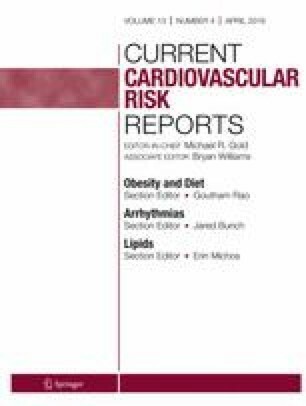 AHA/ACC/AACVPR/AAPA/ABC/ACPM/ADA/AGS/APhA/ASPC/NLA/PCNA guideline on the management of blood cholesterol: executive summary. J Am Coll Cardiol. 2018:25708. https://doi.org/10.1016/j.jacc.2018.11.002.